House dust mites (called by allergists as HDM) are microscopic spiders, found all around the house, especially overabundant in bed linens and mattress. These cosmopolitan guests in human habitation prosper in warm and humid environments and feed off human squama (flakes of shed skin). Allergies are not caused by the dust mites themselves, but by protein contained in their waste. 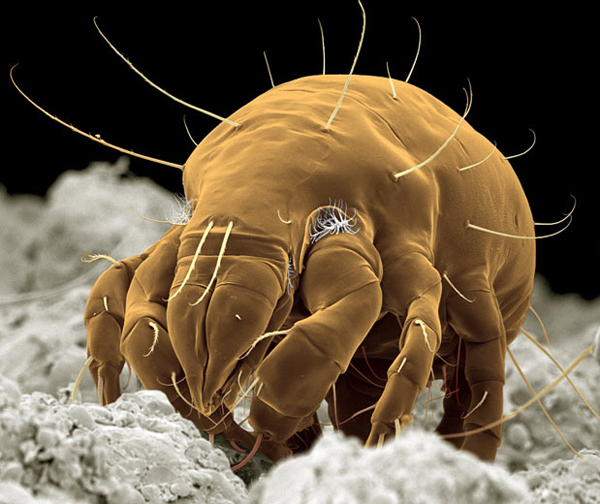 House dust mites are a common cause of chronic asthma and rhinitis worldwide. Apart from warehouse dust mites, those most frequently causing allergies for humans in our area are “Dermatophagoides Pteronyssinus” (European house dust mite) and “Dermatophagoides Farinae” (American house dust mite). These allergens are present everywhere in our houses, especially in mattresses, cushions, carpets, sofas, etc. Pets (cats, dogs, rabbits etc.) are also a vehicle for dust mites and can shed them all over the house. Warmth and humidity are kept relatively constant in our buildings thanks to good isolation and central heating. 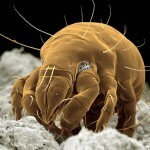 Consequently, house dust mites thrive in this environment and their number is not modified by the change of seasons. Most common symptoms are rhinitis and chronic asthma, problematic all year round with aggravation at night. Conjunctivits is not caused by house dust mites (since eyes are closed at night and the principal contact is in bed). House dust mites allergy has an impact on seriousness of atopic dermatitis ou eczema. Cure: when symtpoms are extremely irritating, that the mucuous membranes are inflamed, causing breathing difficulties, desensitization is the only reliable cure for allergy to house dust mites.